Rasmus Wandall uses quantitative and qualitative methods from studies carried out in Denmark, to address the formal and informal norms and ideologies that are used to generate decisions to imprison. 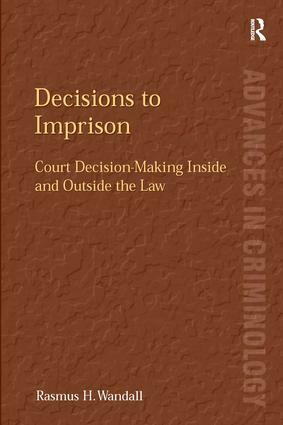 Focusing on the operations of the courtroom participants, his work investigates how court decision-making is organized to allow the sentencing procedure to be open to more than its formal legal framework, while at the same time keeping the sentencing within the boundaries of law and legal validity. The author uses the theory of law's operational closure, developed by Niklas Luhmann. The theory provides an advantageous point of departure to capture the close and subtle interactions between law's need for validity and for contextual openness in every legal operation - including court decision-making. Rasmus H. Wandall is Assistant Research Professor in the Faculty of Law, University of Copenhagen, Denmark. He is also a Criminal Justice Research Fellow at New York University, School of Law.